Every week we release a new online class, and last week’s class was one of mine — it was a “by request” class on lighting location portraits. The idea to do this course came comments in the KelbyOne Community forum from folks who had watched my course on using the Profoto B1x’s on location released a couple of months ago. At the end of the course, I did a Safari-themed fashion shoot, and they said they really liked the live shoot part, and wanted to see more live shoots. So, I went ahead an did an entire course of nothing but live shoots using lighting on location (nothing really about the strobes themselves — just setting up different scenarios and such from scratch. The whole course is seven different location shoots in around 45 minutes photographing a male and female subject). It reminded me of how much I learned just by co-hosting the two classes with Jeremy (I was just there as kind of moderator — asking questions during the shoots). Anyway, Jeremy is an absolute master at turning the most mundane locations into perfect portrait backgrounds, and today I wanted to point you to both of them — they are that good. If you’re not already a KelbyOne member, it would be worth joining for a month ($20) just to watch them, even if you watched nothing else. Here’s a clip (below) from his course shot on location in Miami — it’s just a 3 minute or so clip, but in this short time, you’ll pick up some great tips. Below is the official trailer for Jeremy’s class shot on location in Venice Beach, California. As he says in the video, he shows you how to make maximum use of a very simple location, and he only uses one light throughout. Here’s the link to that full course. I hope you’ll check out these courses — if you shoot portraits on location, they will change the way you think about finding locations, and you’ll be amazed at what you can do this just one light. Really great stuff — he is the real deal. 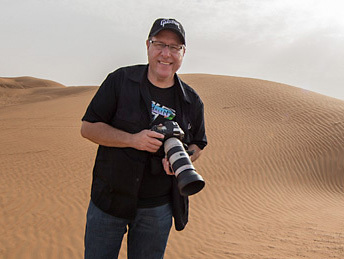 Here’s the link to KelbyOne in case you want to join (and I hope you do).